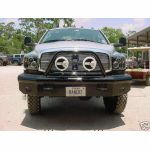 Magnum Bumpers will blow you away with their heavy duty construction and stylish good looks! Made with the off-road enthusiast in mind, Magnum Bumpers offer functionality, smart design, and they look great too. It has bracketry to mount a 20" light bar in the prerunner section. • Accepts up to a 16,500 Lbs. Winch depending on the model of winch. Actual product may not exactly match the image shown here.